GREEN BAY, Wis. (CNS) — Faith and football were the focus of a daylong event July 7 for the Diocese of Green Bay’s Deaf and Hard of Hearing community. The day began at Lambeau Field, where 40 people from five states participated in a tour of the Green Bay Packers facility. Father Klusman, one of 11 deaf priests in the United States, visits Green Bay twice a year, during Advent and Lent, to offer the sacrament of reconciliation and signed Mass to members of the diocese’s Deaf and Hard of Hearing community. During his workshop, held in Mazzuchelli Hall, Father Klusman told the group about legendary Packers Coach Vince Lombardi and his strong devotion to his Catholic faith. He said that Lombardi attended daily Mass at nearby St. Willebrord Church. 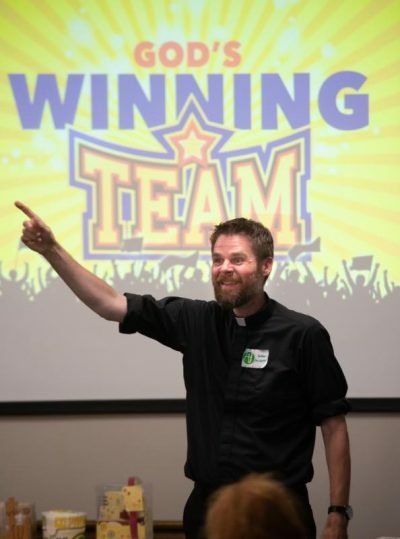 Father Klusman also described the winning ingredients of a football team. He then explained that Catholics also are on a team, God’s team. They have their team colors, as seen at Mass during the different liturgical seasons and feast days. Like winning football teams, Catholics must practice their faith in order to be successful. This includes participating in the sacraments, he said. “Catholics have to practice, practice, practice,” he said, using American Sign Language. His presentation was filled with humor. He said the Packers have enemies: the Chicago Bears, the Detroit Lions and the Minnesota Vikings. A fourth enemy is New England Patriots quarterback Tom Brady, he said, using a slide presentation with photos that elicited laughs. The priest explained that Catholics have teammates, including the saints, angels and Mary. “They are part of our team that lead us to God,” he said. Father Klusman assured those in attendance that God has already chosen them for his winning team, and, like the Packers, their logo has a “G.” He urged the group to make a daily commitment to God through prayer and the sacraments. Immediately after his presentation, Father Klusman offered the sacrament of reconciliation, followed by celebration of Mass in the upstairs church. The day concluded with a dinner. Laux has been friends with Father Klusman for more than 20 years and mentored him while he was a student at the University of Wisconsin-Madison. She credited Fr. Klusman for making the day happen. “I asked Father Christopher if he could come here for Mass,” she said. His response was that he would celebrate Mass, but it wasn’t enough. “We need more (time together),” he told Laux.